Ath Club hasn’t gone off to a good start as they lost their opening day game against Gijon by 2-1 and are 18th on the table with 0 points. On the other hand, we have Barcelona who has started off great in league with a win over Real Betis at home and are currently fourth on the table with three points. 28th August 2016 at 23:45 (IST). Athletic C played their opening day fixture against Sporting de Gijon away from home and lost the game by 2-1. The deadlock was broken in the 50th minute of the match as Duje Cop’s right footed shot went into the goal and Sporting de Gijon got the lead. After that in the 53rd minute of the game Rodriguez doubled the lead for Sporting de Gijon as he scored from his right foot. A Club was able to pull one back as Borja Viguera scored into the bottom right corner but it wasn’t enough as Sporting de Gijon won the game by 2-1. Ath Club dominated possession as they had 61% whereas Sporting de Gijon had 38%. AthleticClub had 13 shots on goal out of which four were on target and Sporting de Gijon had 12 shots out of which four were on target. Athletic Club had 475 total number of passes as compared to Sporting de Gijon’s 298. Barcelona had started their season just like they finished the last one. They played against Real Betis in their opening day match and won the game by 6-2. Denis Suarez and Samuel Umtiti made their debut for Barcelona, and they had to bid farewell to Claudio, Bravo as he confirmed his transfer to Manchester City. Turan scored the first goal of the game in the 6th minute, but Betis was fast to react as they equalized in the 21st minute. After that Messi and Suarez scored two quick goals in the 37th and the 42nd minute. 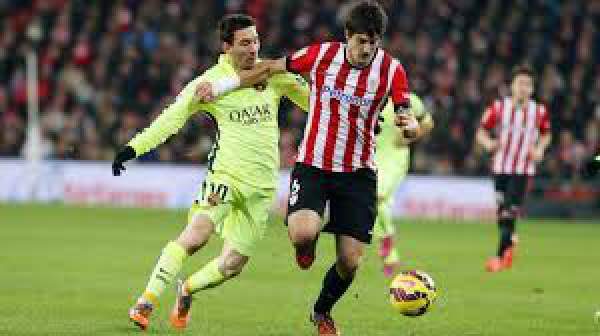 Then in the second half, Suarez and Messi scored two goals quickly, in the 56th and the 57th minute. Then in the 82nd minute Suarez scored his third to complete his hat-trick and made it 6-1, and as the game was approaching its end, Castro scored one to make it 6-2. Iraizoz, Laporte, Balenziaga, De Marcos, Boveda, Jose, Garcia, Benat, Susaeta, Williams, Aduriz. Ter Stegen, Alba, Roberto, Umtiti, Pique, Rakitic, Busquets, Suarez, Messi, Suarez, Turan. Barcelona is in an excellent form and beating them will always be difficult.